Different translators put it different ways: “Fixing our eyes on Jesus …” (NASB, NIV); “Looking unto Jesus” (KJV); “Let us look only to Jesus” (NCV). It’s easy to get caught up in the hustle of the everyday. It’s not difficult to lose focus. Unfortunately, those all-too-common occurrences are when it’s easy to wander into sin, easy to listen to the voices of doubt or fear, easy to lose sight of God. That’s when it’s time to refocus, to start talking to God again, to look for glimpses of Him. He’s already promised that when we look for Him, we’ll find Him (Jeremiah 29:13). In fact, when you begin to look, He’s kind of hard to miss. You’ll see reminders of Him all over the place: the moving water, the light, the door, the wind. You’ll find Him in the smile of a stranger, or the embrace of a friend. As the ad says, it’s easy to miss something you aren’t looking for. This week’s videos make me smile: They remind me of my sons. The Thomas the Tank Engine series was a favorite show at our house. I’ll admit the mom in me didn’t want to watch this clip until I was sure the boy’s favorite toy made it back to him safely. And this Lego creation is, quite simply, insane. According to gadget blog Gizmodo, it was built by “Lego genius” Akiyuki over the course of two years and consists of 17 modules that process 500 balls for a length of 101.7 feet at a rate of one ball per second. I get the feeling this is the type of thing Rob was secretly planning when he kept requesting Lego bricks at every gift-giving occasion. If you’ve found a video you think would work for an Intermission, please drop me a note at BeaMuses@gmail.com. I’d love to hear from you! Roger and I are taking another biblical studies class this fall, “New Testament: The Gospels.” One of the class assignments, unsurprisingly, is to read the gospels—Matthew, Mark, Luke and John. I’ve been reading them through in larger chunks, with the goal of gaining an overview and then coming back to one of the books and perusing it in a more leisurely fashion. Read this way, it’s a sweeping panoramic view. Instead of drilling down into a particular verse or story, I’m gaining a better sense of the larger narrative. The gospels are, after all, a story. They tell the story of Christ on the earth, of the believers and the very beginnings of Christianity. It’s a large story that’s still being told. At its most basic, the idea of Christianity is seeing where we fit into the story God is telling, and of yielding ourselves to it. Happy Thursday! In keeping with tradition, it’s time to take a break from your week to enjoy some videos. And they figure prominently in this clip as well. I think I’ll just be spending the day inside, away from the gulls–where it’s safe. Is there any more beautiful description of the Christian life? Love of friend, love of brother; love of stranger, love of neighbor. This kind of love isn’t simply a “felt” love; it is worked out in actions—in blessing others, in relieving suffering, in helping those who need it, in bringing comfort, in rejoicing with those who rejoice and mourning with those who mourn. This is the practical outworking of the faith we hold. How will you show the love of Christ today? Thanks for joining me! 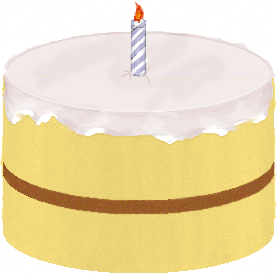 This week I’m celebrating my one year Blogaversary. Yesterday I shared links to some favorite posts from the past year. Be sure to check it out–you may find something you’d missed. May your day be wonderful! See you tomorrow. And rather than trying to share what I’ve learned about blogging (talk about a short post! ), I decided to look up some favorite posts from the archives. Maybe you’ll find something you missed the first time. 4. What Does Love Look Like? To those of you who have been reading, thank you. I can’t express how much I appreciate it! This is for you: Statistical proof that you, dear reader, are awesome.